A properly installed irrigation system means putting an end to the frustrating job of manually watering your lawn. Simple to use and easy to maintain, in-ground sprinklers provide peace of mind and convenience. Your entire lawn will consistently receive the correct amount of water that it needs. Shrubs and flower beds will not be neglected or over-watered and you will be in compliance with all local watering regulations. 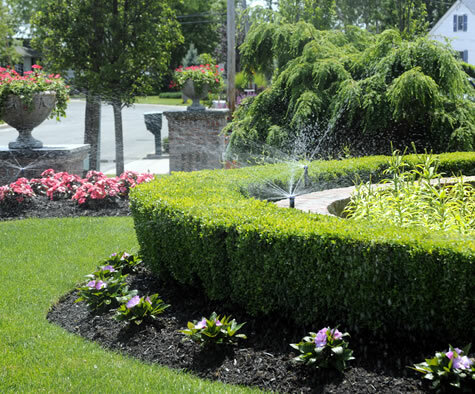 Hi-Tech Irrigation has installed thousands of residential systems on Long Island. We work throughout Nassau and Suffolk counties to provide the highest level of professional service in the business. At Hi-Tech Irrigation, our goal is to provide you with a maintenance-free irrigation system that is both cost effective and energy efficient. Our trained technicians will work with you to design a custom in-ground sprinkler system and watering schedule that meets all of your irrigation needs. They will listen to your individual needs and discuss the best options for your lawn. Once you have approved a design, our team will begin the installation process. Our experienced crew uses modern line laying equipment, which ensures minimal damage to your lawn. All sprinkler heads are checked and adjusted after installation to guarantee that your lawn is getting even and full coverage. We will teach you how to use your system’s timer and walk you through any questions you may have about using the irrigation system controller. In addition to your residential sprinkler system installation, we also offer repair and upgrade services for homes with existing irrigation systems. Our skilled team will inspect your current system and determine any improperly working zones or sprinkler heads. It is often possible to re-design and renovate your sprinkler system in one day. Fully licensed and insured, we use only top grade irrigation products. The addition of an in-ground sprinkler system will add convenience and curb appeal to your home. Contact us today for your free estimate.